An abscess is an infection leading to a collection of pus. An anorectal abscess is an abscess located around the back passage. It is twice as common in men as in women. It commonly occurs (9 out of 10 cases) after a gland around the back passage becomes blocked and infected leading to an abscess. 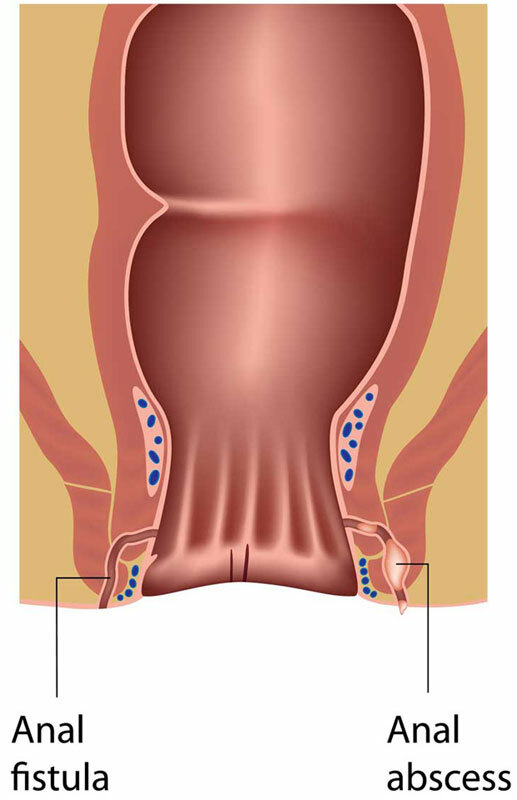 Sometimes the abscess may drain itself internally inside the lower part of the bowel or through the skin around the back passage forming a fistula. If it goes untreated it rarely resolves on its own and can spread to the tissues surrounding the abscess or spread into the blood steam and become life threatening. The main symptom of an anorectal abscess is pain around the back passage especially when sitting down. This may sometimes be associated with a swelling around the area, symptoms such as a having a fever, generally feeling unwell, discharge of pus or not being able to open your bowels. If you have a condition such as diabetes, excess weight, take medication which dampened your immune system such as steroids you are at a higher risk of the infection spreading. A careful history of your symptoms will be taken and you will be examined to confirm the diagnosis and exclude other conditions. Usually the diagnosis should be able to be made through the examination but sometimes additional tests such as blood tests, an MRI or CT scan may be required to confirm the diagnosis if the presentation is not typical and a deeper abscess is suspected or to exclude other pathology such as Crohn’s disease, hydradenitis suppurativa (inflammation of the skin) or cancer. Sometimes an examination under anaesthetic is required to establish the diagnosis. Sometimes at the very early stages antibiotic treatment may be able to treat the abscess but this will need careful monitoring. If symptoms persist though surgery under a general anaesthetic is required to cut open and drain (incision and drainage) the abscess. Three out of five people will have no other problems once the have had surgical treatment. The remaining may develop a further abscess or a fistula which may need further treatment.